​GEARS is excited to announce a new FIRST LEGO League Off-Season partnership with the Saint Joseph Health System. 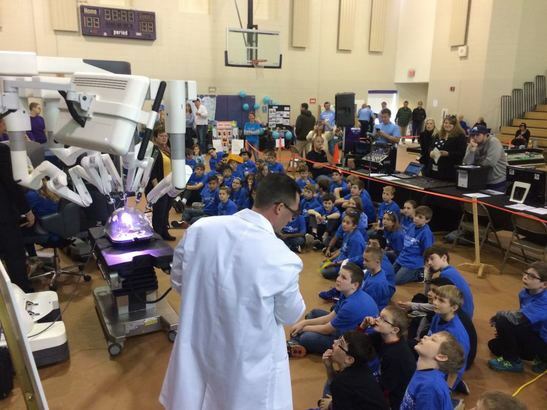 We will be hosting a series of four FLL Robot Game events that take place in four different venues in the Michiana area. Unlike traditional one-day events, this four-day event affords teams the unique opportunity to return to work after each competition, to sharpen skills in an effort to have greater success in the days to follow. Teams are encouraged to share, observe, advise, or simply visit with other teams each day, so they can learn from each other in the true spirit of coopertition (a FIRST core value). Since each competition is spread 3-4 weeks apart, teams have ample time to modify their robots or adjust their strategy in an effort to improve their performance at the next event. This is a great opportunity for teams to focus strictly on the designing, building and programming of robots. It can also be used as a recruiting tool for next season. For this reason, we are allowing students currently in 3rd grade to participate as they will be old enough to be on a competition team in the fall. You may organize your team in any way you wish. Teams who have already competed in an official FIRST LEGO League event during the Hydrodynamics season are also free to re-organize their teams in any manner they wish, or keep the teams the same. (See RULES for more information about team organization.) Teams are free to use the same robot used in other Hydrodynamics events, or compete with an entirely new design. Each team can choose their best strategy, but all FLL game rules still apply. Off-season events like this provide a great opportunity for those less familiar with FIRST programs to discover all that FIRST LEGO League has to offer. Youth groups like Scouts or 4-H can learn more about the EV3 robot, the programming language and game details in a less formal setting, while also enjoying the chance to meet other teams and coaches who can share their own experiences in FLL. Off-season events leave coaches and kids feeling more confident and ready to take on the new FLL challenge in the fall.